Since 1985, the Saskatchewan Brain Injury Association has been helping individuals and families deal with the effects of traumatic or acquired brain injury. Founded by families whose children sustained brain injuries, the Saskatchewan Brain Injury Association (SBIA) is a registered charity, registered under the Saskatchewan Non-Profit Corporations Act, which provides support and service free of charge to individuals and families who are living with the effects of acquired brain injury. Information, service advocacy, support and guidance for individuals and families coping with the effects of ABI. Each month, our Provincial Toll Free Support Line receives between 50 and 100 calls, and our Web Site provides information to nearly 7,000 hits. 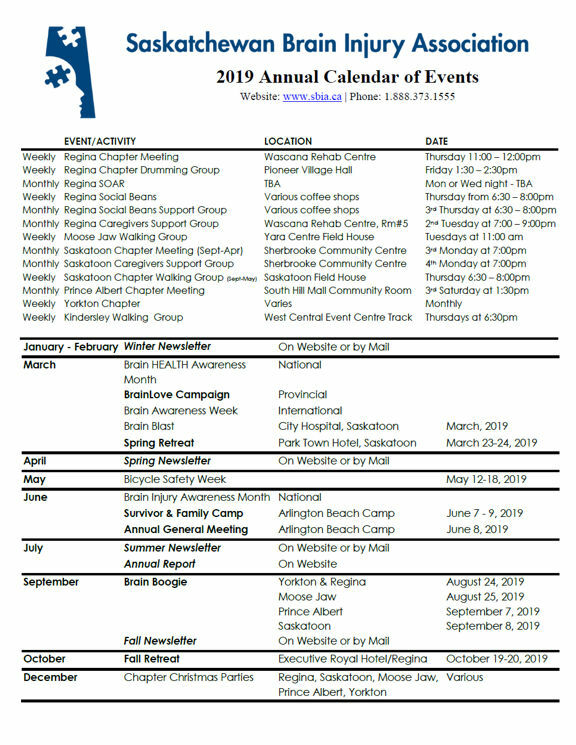 Educational programs for the public as requested and regularly for ABI Survivors and their families at three major retreats held around the province. Retreats as well as the Positive Steps Walk-a-thon provide opportunities to gather as a community to learn from each other. Referrals to and support of peer Support Chapters in Saskatoon, Regina, Prince Albert, Moose Jaw and Yorkton. Support Chapters meet weekly or monthly and organize regular activities for survivors. We distribute information and educational materials about acquired brain injury and its PREVENTION throughout the province. We manage and maintain a Provincial Information/Resource Centre for students, professionals, survivors, and their families. SBIA has a strong presence at the national level, with representation on the Brain Injury Association of Canada board. SBIA is a leader in developing initiatives that can expand into national programs.